Altered Alchemy : SEO - what is it? over the past 2 days i have been having some interesting, out-of-my-domain kinda conversation with a couple of ladies at Mixed Media Art @ Facebook. we were discussing about some ways to market our work and ourselves better. ye know ... that is the worst part. i would love to just make art and let someone do the marketing ... or just make art period. but i would love to make a living out of it if i could. there were loads of suggestions and one of it that intrigued me was how to drive traffic to your site so that your work would be seen by more people. and since my sales totally depend on the internet, naturally this was the topic that got my attention. i have heard of terms like SEO, page ranks, search engine robots etc ... i'm sure you have too. and no, these are not bookbinding techniques! wish they were, cos then they'll be easier to understand!! anyhow SEO is search engine optimization. how to get search engines like google or yahoo (and the rest) to find your site more efficiently so that consumers would also find your page easier when they google a keyword pertaining to what you do ... for my stuff would probably be along the lines of 'mixed media jewelry', or 'handmade books'. apparently there are some things that the search engine robots cannot see. photos are one of them. and you know what ... my blog is full of photos!! ugh!! which means the keywords need to be plastered all over the content of the blog post itself, which is something that i am reluctant to do becos then, the post would look so fake. it would be like me pasting myself all over with branded logos!! the ladies at MMA said that there was a way to make the robots see your photos. so i searched the net and i found the solution. it's pretty easy to do tho it can be quite time consuming. 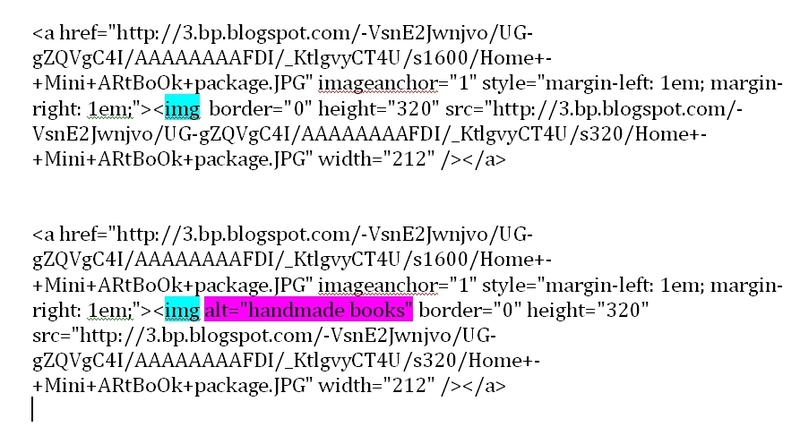 all you have to do is to add alt="your keywords" within your image's HTML. when you write a blog post, on the top left corner there are 2 tabs. one says 'compose' and the other 'HTML'. you want to click on the 'HTML' to get to the computer language of your image. 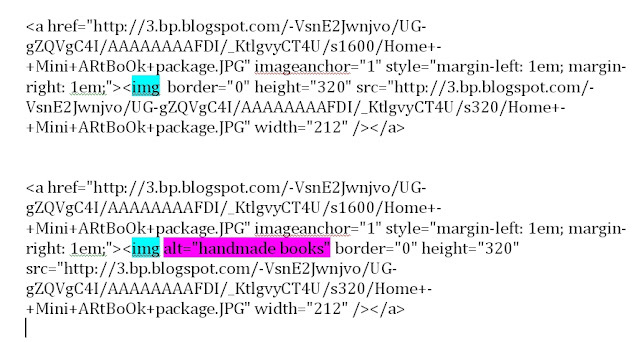 typically the HTML of an image would look like this. all you have to do is to add alt="your keywords" right after the <img tag. your keywords can be words pertaining to that particular image. my keywords to my photos would typically be "handmade books" , "handmade journals", "mixed media jewelry" and stuff like that. you need only to put 2 or 3 words between the invert commas. anything beyond four words would be a waste of time as the robots won't read that many words. it's tedious cos you'll probably have to do this to a lot of your photos every time you post. but if you like to increase your page ranks on the search engines, this is one way to do it. Thank you for this info! I've been wondering what SEO meant and how to implement it. I'll be trying this on my next blog post--if Blogger is behaving then. Thanks for the great advice I have tried adwords for SEO but I am going to check out the others to. Thanks for the info Luthien... hope it works for you. Ah, you're a wealth of information! I know there are so many who would value from this Luthien ~ bravo! Very interesting, Luthien, and very useful. Thanks for doing the research for the rest of us. Super, thanks for the tipp. Not only do you create MAGNIFICENT artwork & Journal MAGIC...but you are SO HELPFUL TOO!!! Thank you for this tip...who knows how long it would've taken me to find out such important info?!! PS. Keep up the EXTRAORDINARY Artistic Inspirations...yours is a RARE TALENT and an AMAZING EYE!!! thank you for your comments!! i'm glad you found this useful in some way. tho it's just one part of SEO. there are still so much i am absorbing from reading on the net about SEO. man ... it's so complicated! Thank you for sharing. I'm now thinking I need to talk with my husbands friend to learn how to do this myself, and what else I need to do to promote my blog more, and get it out there. So not tech savvy, but I'm sure I will get there. Just wanted to say your work is beautiful.